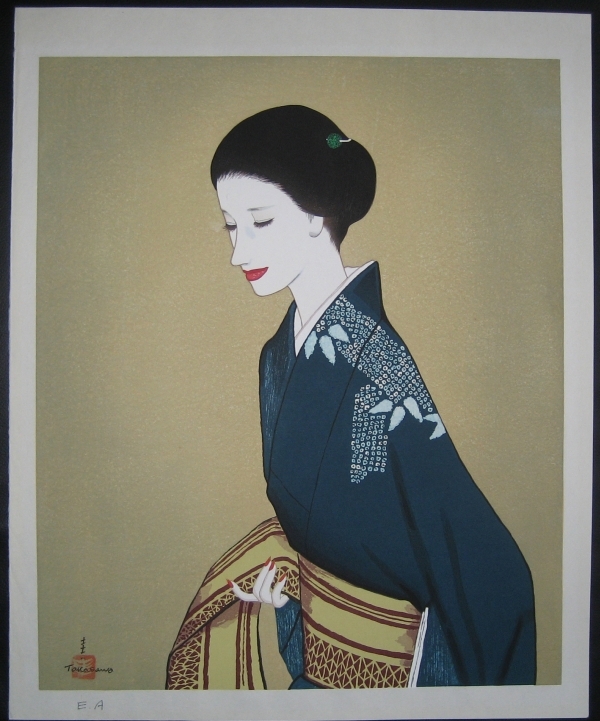 Description: Double oban sized (37.5cm wide x 45cm) bijin-ga woodblock print by Keiichi Takasawa (Takazawa). The model for these bijin-ga prints is widely reported to be his wife. The print shown is an epreuve d'artist - artists proof. The final version was produced in a limited edition of 200. I've only been able to find two copies from the limited edition of this print online and both were framed with their margins covered but Takasawa's other prints of this style from this period were carved by Maedo Kentaro, printed by Ritsuzo Sato and published by Yuyudo.